Pond Landscaping Done Right - Legends Landscape Supply Inc. Designing and building your own pond or water feature will be more fun and fulfilling than any other landscaping project in your yard. We all enjoy being around water, even something relatively small like a backyard pond. As a living ecosystem it will be constantly changing; a dynamic landscape feature that provides soothing sounds and views into a mysterious world. Though maintaining a pond is not difficult, there are a few important things to know about pond landscaping. To avoid problems with water quality, your pond needs to be of adequate size. At least 40 cubic feet is a good minimum. If it is was a rectangular pond, that would be four by five feet and two feet deep. As most ponds are somewhat irregular and rounded, you might aim for close to five by seven feet, with depths increasing from one to two feet. There should be some depth variation in your pond. Have a shallow shelf a few inches deep and one or two deeper shelves. If you are going to have fish, your pond needs to have areas at least two feet deep. Three feet is a better depth if you want koi in your pond. Excess nutrients and lack of aeration are the most common reasons for stagnant or green water in backyard ponds. You need a pump to provide oxygen and keep the water moving. Water movement keeps mosquitoes away, too. Plants help to improve water quality and break down nutrients in the water. Use both submerged and floating aquatic plants. Along with the pump, your pond should have a filtration system. It may be contained within the pump or a separate container. Some do-it-yourself types like to build their own filtration system. We can provide you with options suitable for the size of your pond and pump. The combination of plants, aeration and filtration should keep your water clean and clear. There are a few simple steps to help prepare your pond for winter. Clean it thoroughly and remove leaves and other organic matter that have settled to the bottom. Cut back rapidly growing aquatic plants; you don’t want them to take over the pond during the winter months. Your pond’s metabolism slows down during winter; consider adding some cold water-beneficial bacteria. These are available at our store and help keep the pond system healthy during winter. Be aware that your fish need less food during the winter. Overfeeding fish is one of the main causes of poor water quality. While it can happen at any time of year, overfeeding is particularly easy to do during winter. Our experts are a valuable source of backyard pond information. It helps to have some advice when deciding on the right type of plants, fish and other materials. We can also help you diagnose problems if something seems to be wrong with your pond. When everything is in place within your pond, see that the surrounding landscape blends with the new water feature. Partially submerged boulders and water tolerant plants connect your pond with the planting beds around it. They also create places for frogs and small birds that may enjoy the shallow water’s edge. 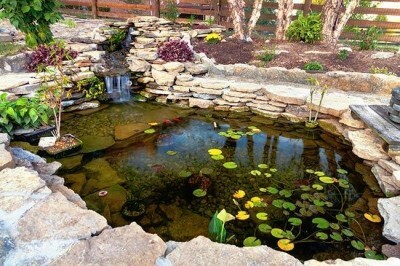 You, too, will enjoy the interaction of fish, plants, water and landscape created by your backyard pond. Visit our showroom today to see the great supplies we carry for your water feature. Written on Monday, June 23, 2014.